All the ingredients you need to make this bag! 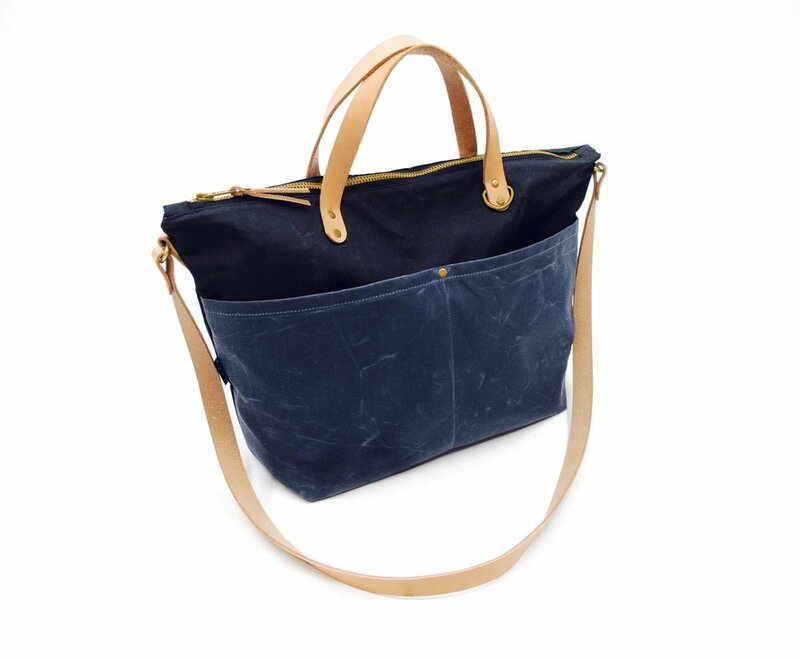 Light, durable, and secure, The Fremont Tote is your hardworking everyday waxed canvas bag with a durable zipper, lots of pockets, and strong leather handles secured with metal rivets. Carry it by the handles or go hands-free and sling it across your body. 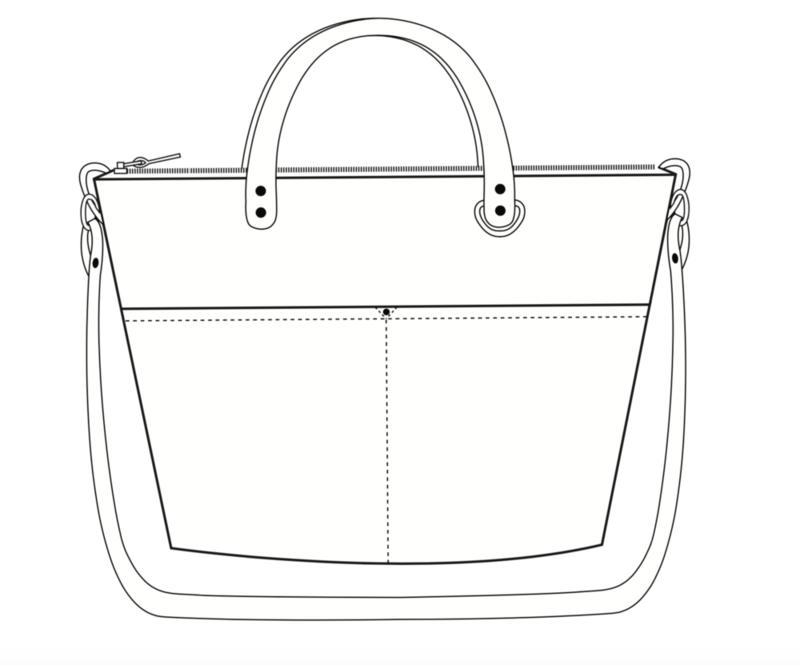 The off-white canvas lining enables you to see what’s in your bag with ease, while also providing structure. All fabric is cut-to-size, marked, and ready to sew! We’ve paired rugged 8 - 10 oz waxed canvas with 12 oz off-white natural duck canvas lining. We source our leather with comfort, durability, and style in mind. Leather straps are 5-7 oz. They come round end and hole punched for a professional look. All hardware included, even extra rivets! Choose from one of our popular color combinations or pick custom colors at checkout. These are tutorials only. 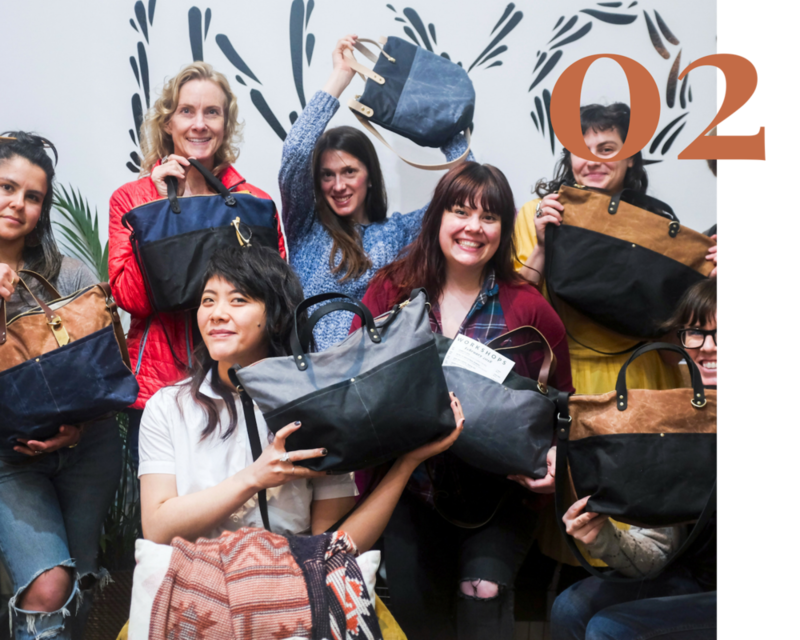 For or a full online class, sign up for our Bluprint Fremont Tote class! (2) Leather Handles: 14" x 3/4"
(2) Leather O-Ring Tabs: 6" x 3/4"
(1) Leather Cross-Body Strap: 45" x 1"
(12) Medium Metal Rivets: 10 + 2 extra! D-Ring to attach keys or bling! We cut & prep everything for your Fremont Maker Kit, ready to sew! Use this gallery to help you choose your colors. 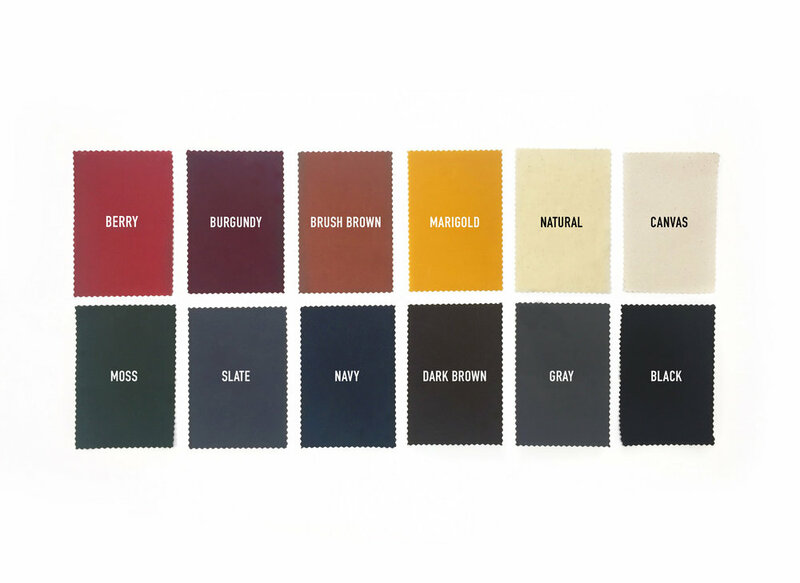 We’ve included some of our favorite color combos to help you out! *The tan leather will soften & naturally patina over time. 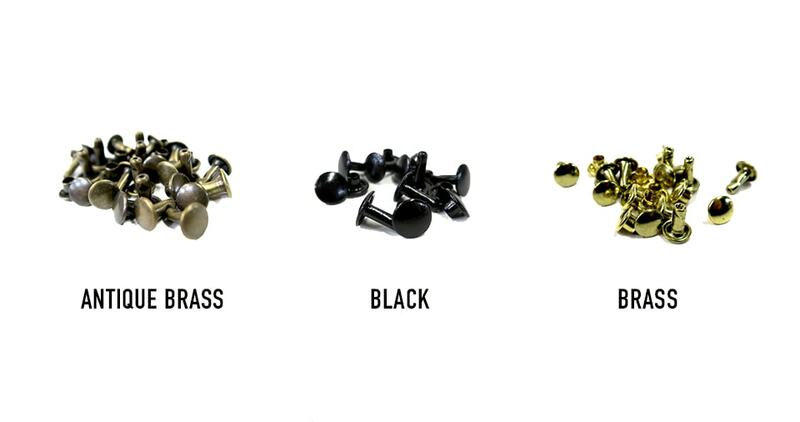 Available in Brass, Antique Brass, and Black. *We’ve tirelessly researched the best quality hardware out there! Sometimes the finishes will vary slightly, because the hardware is sourced from various places. In order to provide you with all the beautiful colors, we source from a few different mills. One of which is an original waxed canvas mill in Scotland. I am so excited! 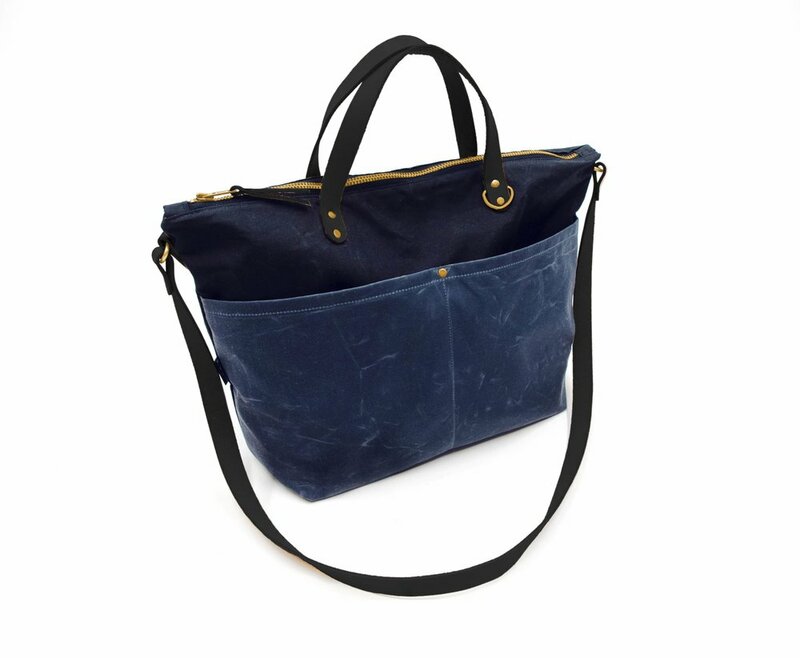 I ordered your Fremont Bag kit from Bluprint, and watched the online class (over and over). So thankful you are doing that, as the cost associated with coming from Savannah, GA to Oregon to make a purse is not something my husband would understand or go for! Ellie, you are such an AWESOME teacher! I love how you explain each step, and give us tips on WHY we are doing whatever it is. You give us great practical tips. I made the kit up, and I think it’s so cool! 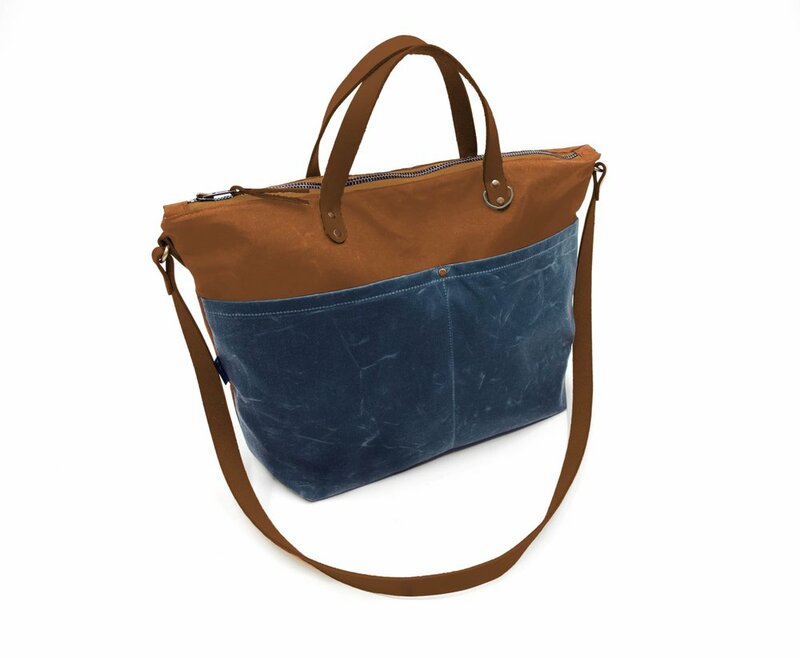 I was feeling so confident with what I’d learned from your wonderful teaching, that I ordered some waxed canvas and leather strapping, rivets, and then using some “tooled leather” upholstery fabric I had already, I made a second bag. I can really DO this!! Yay! Thank you so much for the great online class! "Klum House rocks! I feel so proud of myself. I still can’t believe I walked away after just 3 days with such an amazing bag, but it’s really what I learned that is so important. Ellie is truly the most amazing teacher and maker! She is thorough and patient. I’ll definitely go again. Thank you Ellie!" "Thank you so much Ellie! We really had an amazing time. All intimidation melted away within minutes of your instruction. You're an awesome and inspirational teacher. " “I really enjoyed the sewing class I took with Ellie. She is an incredible teacher who is patient, really takes the time to make sure you understand every step and why you do things, and has a strong interest in helping you succeed. "Words can't explain it. You have to come to Klum House + sign up for a workshop to believe that a place like this exists in the world. Absolutely amazing." "I took the Sew Like A Boss workshop yesterday. I definitely feel MUCH more confident! I was easily able to create another bag at home with all the skills I have learned. The instructors were so supportive and thorough. Thank you!!" "I liked how Ellie already had an agenda in place for the class, but was flexible with our questions. She has a great welcoming personality which works well for us 'new-to-sewing' types that may feel a bit overwhelmed getting started. I liked her style so much and learned so much that I signed up for more classes. Thank you Ellie!" “I'm pretty shy & I was nervous about taking a group class, but it was really fun! The teacher was patient with mistakes or problems & I learned a lot about troubleshooting when working with heavy fabrics. I love that I came how with a finished product. And that her dog Winston hung out with us!" "After completing a sewing class at Klum House, I feel a lot more confident. I've always been afraid to touch a sewing machine— Now I feel like I can tackle some projects. I really feel like I have a basic understanding of sewing now." "Ellie is such an encouraging teacher and clear as a bell in her instruction. She broke complex information down into understandable bits, and explained the why's as much as the how's." "I liked that the class was small, so I was able to ask questions. I loved that there were choices in color & snaps! I'm so happy I can thread a sewing machine now!" "Where to begin! This is such a special and welcoming place, especially to someone with no previous sewing experience. Ellie made the learning process super easy and her dedication to the craft and love of teaching really shined through. The class and guidance was thoughtful, enlightening, entertaining, and at the end I left knowing how to use a sewing machine and with something I made myself! How rad is that? I couldn't recommend this experience more and I can't wait to go back myself for another class!" "Getting personalized help and feedback was really wonderful. With the small class sizes, I really learned a lot. Ellis is patient and really helps me understand how and why we are doing things certain ways, so it's easier to replicate the bag on my own. Plus it's AWESOME to go home with a finished project."